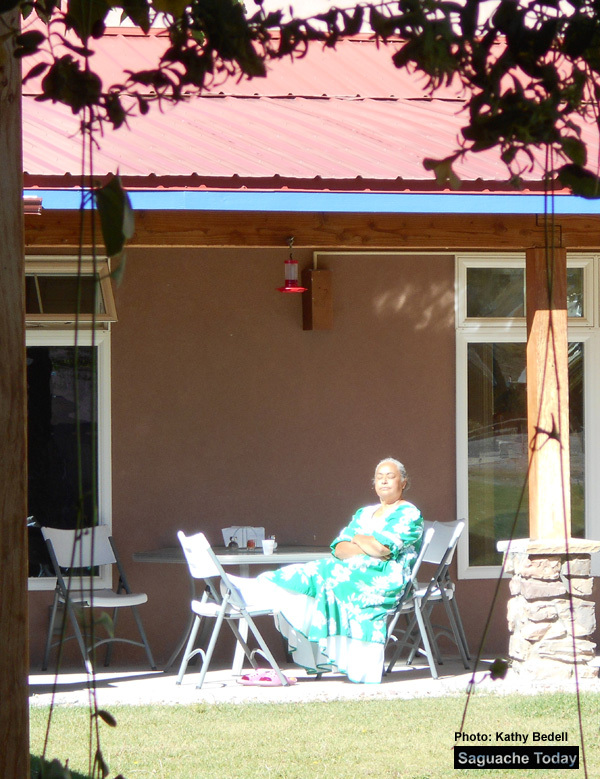 The Saguache Sagebrush Quilters’ annual retreat took place September 30 – October 3. This is the third year for the group’s Sew -n- Soak weekend which took place at Joyful Journey Hot Springs Spa. The weekend was led by Pam Jernigan, a notable landscape quilter from Texas who taught a series of classes and techniques over the weekend. Jernigan was assisted by Laura Clary an artistic quilter from Georgetown, Texas. The group came together to share ideas about coordinating fabrics for their own natural landscape quilt. The weekend gives quilters the dedicated time necessary to push their projects towards completion. Jernigan’s journey to quilting is an incredibly interesting story and has a local connection. “In 2014 I made my first quilt – a landscape quilt of a friend’s garden in Crestone,” explained Jernigan in an interview with Saguache Today during the retreat weekend. “I love working with different kinds of fabrics and textures, including sheer fabrics, yarns, and other embellishments. Jernigan has won several awards in quilt and art shows, as evidenced in her one-of-a-king royal Princess which stretches 9 feet in length and carries a stoic beauty while inviting you to reach out and touch he colorful feathers. It’s a weekend of sewing and soaking at the annual Saguache Sagebrush Quilters retreat at Joyful Journey Hot Springs on October 1. Participants turned creative while each made their own landscape wall hanging under these instructors’ guidance and encouragement. Kits which contain fabrics appropriate for landscape scenes were provided for a minimal fee. Ladies who didn’t realize they had creative skills, surprised themselves and were happy with their results. Watch for a display of these artistic will projects at the 2017 Fall Festival and Quilt Show. On Saturday evening a delicious Mediterranean dinner was served by Lynn Ertle a member of the club and local caterer. Soaking in the hot mineral springs was a delightful way to end the day and relax tired muscles. Quilt members wish to thank the public for all their support in so many ways. Proceeds from ticket sales for the quilt drawing help to defray the cost of hosting the retreat each year. Donations of fabric are also greatly appreciated and some of these fabrics are used to make “comfort” quilts which are given to community members who may need some comfort at certain times. This entry was posted in Uncategorized and tagged Saguache, Saguache Colorado, Saguache County Colorado, Saguache events, Saguache news, Saguache Sagebrush Quilters, Saguache Today, Saguache traffic, Saguache weather, SaguacheToday.com. Bookmark the permalink.